You just can’t beat fresh homemade pesto. It’s so quick and easy to whizz together in a food processor and it instantly takes cooked pasta to the next level. 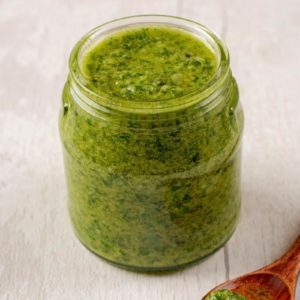 This Mixed Herb Pesto uses a mixture of 4 different herbs, rather than just basil, so it’s a great way to reduce food waste. An easy pesto recipe with so many uses. Traditionally pesto is made with basil and whilst I am all for that (it’s probably my favourite herb), it doesn’t mean that you can’t make it with other herbs too. Or a mixture of herbs, which is what we have done in this recipe. We used a mixture of basil, chives, coriander and parsley, but any leafy herbs (rather than woody ones) will work. 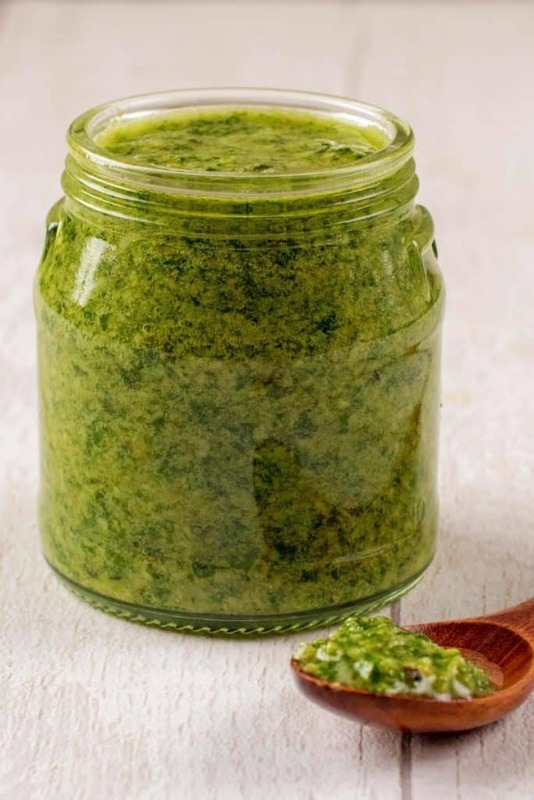 It doesn’t just have to be herbs that you can use in this homemade pesto (although that should be the star ingredient), but you can add green leafy vegetables like spinach and kale too. Such a good way to hide veggies if your kids don’t love them. Because what kid doesn’t love pesto pasta? We try really hard to reduce our food waste, but herbs is something we can always improve on. We buy a bunch for a recipe and use half of it and then the other half gets forgotten about in the fridge until we do a clear out. This how much waste that adds up to over the year! So, we are going to be sharing our favourite ways to us up fresh herbs, this being one of them. This pesto is so simple to throw together that it really isn’t that much more complicated than going to the shop to buy some and then opening up the jar. You just throw all the ingredients in to the food processor and whizz it together. That’s why pesto pasta is the ultimate easy weeknight meal. Fresh pasta takes just a few minutes to cook and whilst it is simmering away you can blend up this fresh pesto. Throw in some leftover cooked vegetables and/or some cooked chicken and you have yourself a filling and easy meal. Pesto can be a great vegan pasta sauce, as long as you make a vegan version of it. 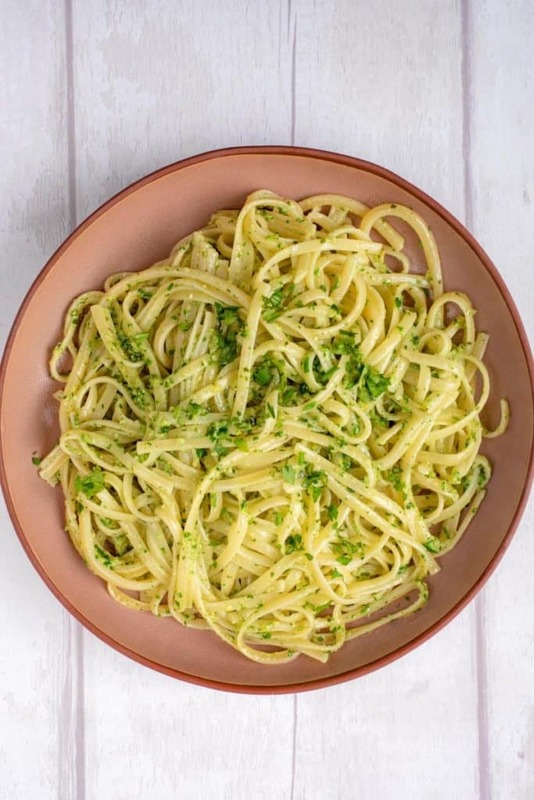 It’s easy to make vegan pesto – just swap the parmesan for nutritional yeast. You won’t need quite as much though, as it has a strong flavour, but I know some people love that. So it really is a judgement call. The great thing about pesto is that it has so many uses. Whilst the classic way is to simply stir it through some pasta, you can also use it as a pizza base, stir it in to cream cheese or yoghurt for a dip, spread on chicken and top with cheese before baking or use it in a salad dressing. Never let pesto go to waste! A pinch of sea salt and black pepper. One: Add the garlic, pine nuts, herbs and salt and pepper to a small food processor and whizz for a couple of seconds. Two: Add the parmesan to the food processor. Three: Keeping the food processor running, slowly add the olive oil until it is all combined and you have a smooth pesto. 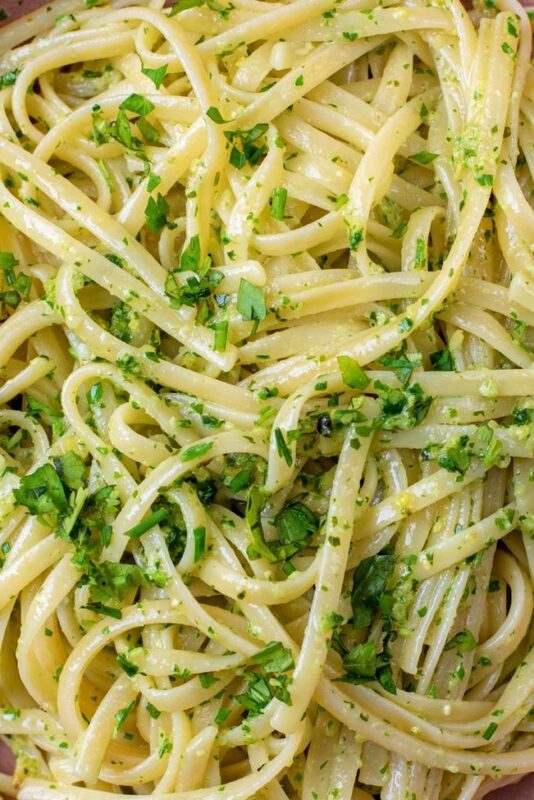 Serve this easy pesto stirred through some fresh cooked pasta for a simple weeknight meal. Use a variety of herbs to reduce food waste. Just stick to leafy herbs rather than woody ones. Make this homemade pesto vegan by swapping the parmesan for nutritional yeast, but use less as it has a stronger taste. Do you want to be kept up to date on more delicious posts like this Homemade Pesto? Please subscribe to the blog mailing list (it takes 30 seconds). 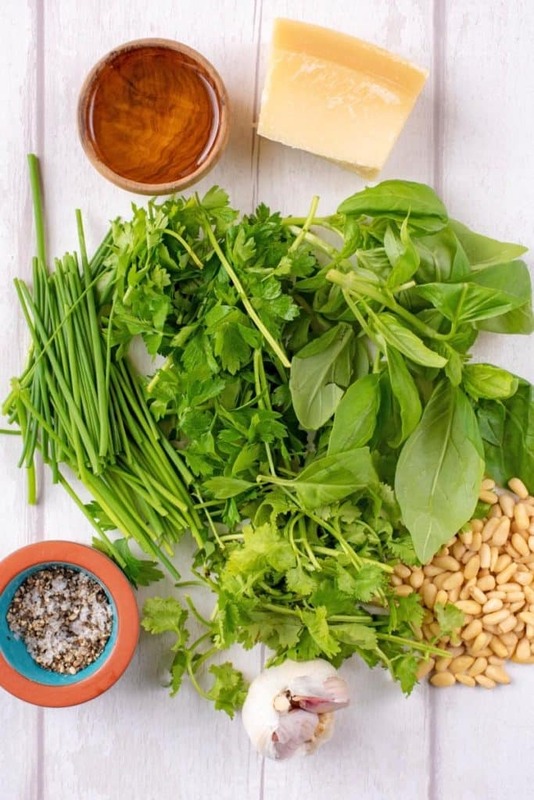 If you’ve tried this Mixed Herb Pesto Recipe, or any other recipe on the blog, then let us know how you got on in the comments below, we love hearing from you! You can also FOLLOW US on FACEBOOK, TWITTER, INSTAGRAM and PINTEREST to see more delicious recipe ideas, behind the scenes shots and also what we are getting up to. 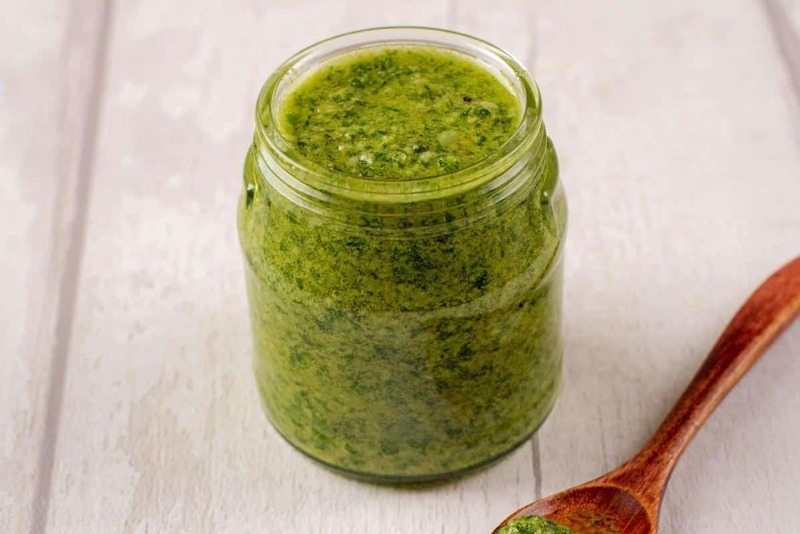 This Mixed Herb Pesto uses a mixture of 4 different herbs, rather than just basil, so it's a great way to reduce food waste. 1 pinch sea salt and black pepper. Add the garlic, pine nuts, herbs and salt and pepper to a small food processor and whizz for a couple of seconds. Add the parmesan to the food processor. Keeping the food processor running, slowly add the olive oil until it is all combined and you have a smooth pesto. I absolutely love pesto, but typically only use basil pesto so I’m totally looking forward to trying this one! YUM! I’m a big pesto fan and like to try all sorts of pesto. Here in Italy there are a number of regional pesto recipes, not just basil. But, I love your idea of using up leftover herbs in pesto! I also often have leftover leafy herbs, especially parsley, that get forgotten in the fridge! Definitely going to start using it pesto! I love this recipe. Fresh Pesto is the best but I never thought of making my own until now. I use the pesto for everything! From pasta, to pizza, this pesto is the star of every dish it’s in. I was looking for a mixed herb pesto recipe for such a long time. This is so easy to make, perfect to sneek into my busy schedule. You are right, NOTHING beats homemade fresh pesto!! 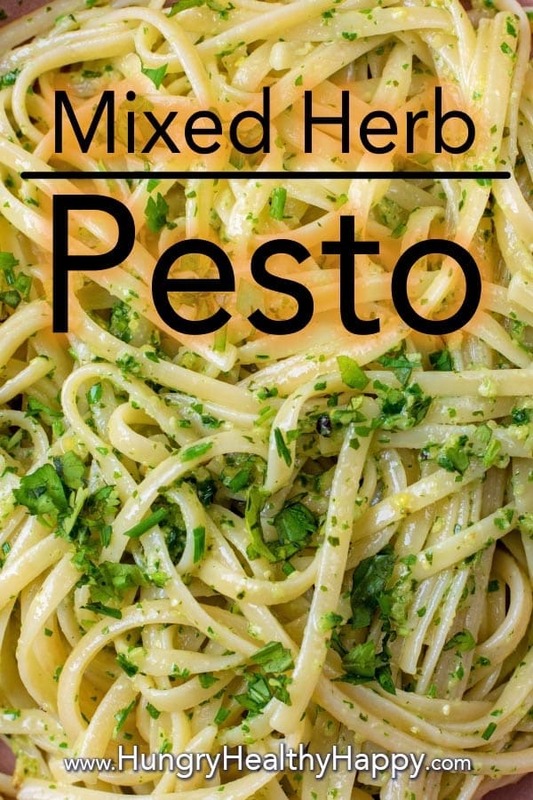 I love pesto, and i love adding it to my pasta! This looks delicious. I love making pesto. What a great idea to add different herbs instead of the basic basil. Thank you! I haven’t made pesto in a long time but I really like the homemade version. It looks so good! What a great way to use up bits of extra herbs! I’m like you, I buy it for a recipe and then forget about the little bit that’s left! This looks awesome! I love the idea of playing around with the herbs! With it being spring I would love to add some chives! I’ve dabbled in using other herbs in my pesto, but not nearly enough. This looks delectable! And I love any way to use up food to avoid wasting it!! Thanks for the great idea! Oh it’s gorgeously green…it should be called Emerald City Pesto! You’re absolutely right, you can’t beat homemade pesto. The flavours are so much better and delicious. Ideal for a quick and easy mid-week meal. I hate wasting any fresh herbs, so this is a great way of using them up. Great idea using herbs other than basil. This pesto sounds packed with flavour!